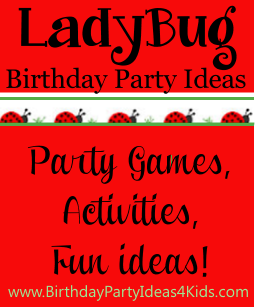 Ladybug birthday party ideas for kids of all ages! Fun ideas for ladybug themed party games, invitations, decorations, activities, food, favors and more! Buy or make cute printed ladybug cards. Create a card by cutting circles about 4" around from red and white cardstock. On the red card draw 6 small circles and cut them almost all the way out - leave a portion of the top of the small circle attached. Then place a red circle over a white circle and trace the openings of the spots you just made. On the white circle write in the party information in the circles you just traced. Then glue the red circle on top of the white circle. Write on the outside flap of each circle what information you wrote underneath it. Time, Date, Address, RSVP, etc. Decorate the red circle like a ladybug. When the guests receive their invitations they open the black dot flaps and find out the party information. Decorate the party table with a red table cloth. Cut out black circles of different sizes and place on top of the table - then cover with a clear plastic table cloth. Tie red and black helium balloons on the backs of the chairs, or use red helium balloons and color on black spots with a permanent marker. Red and black streamers are always fun. Red and black helium balloons (more red ones then black) tied on the mailbox lets everyone know where the party will be. You can also cut out large circles from poster board and lay them down on the walkway to the front door. Played the same way as Pin the Tail on the Donkey only children try to pin a missing spot on a ladybug. Draw a large picture of a ladybug with six spots. For one of the spots don’t color it in black, just leave it white. This will be the spot that the children try and get their spot closest to when playing. Cut out several circles the same size as the missing spot on the poster. Color them black and number them on the back - one number for each child attending. Blindfold the guests one at a time and have them try and stick the spot (use double sided tape on the back of the spot) as close to the missing one as they can. Closest wins a prize. Let the party guests discover nature! This fun scavenger hunt will get the kids excited about the great outdoors and let them learn a little more about the ladybugs' habitat. Before the party find an area that the kids will be able to explore and that has interesting items to find - a park or backyard works well. Explore the area a few days before the party and write down interesting things that the kids could spot while they are searching. Make a list of 10 - 20 of the nature items that you find. You can also print out our free list and add you items to it. Before the party starts cut large leaves out of poster board or felt about 1 foot long. Make one leaf per guest. Set the leaves on the floor of the area you will be playing in. Tell birthday guests that they are going to pretend to be ladybugs. While the music plays they will fly around the room, but when the music stops they must find a leaf to land on and stay there until the music plays again. Buy small prizes - enough for each guest. Number each prize and on the back of each leaf write the number that corresponds with the a number you wrote on the prize. After the last round of the game ask the guests to pick up their leaves and they will find a number on the back. Then give them the prize that matches their leaf. Make fun ladybug antenna’s with headbands, pipe cleaners and Styrofoam balls. Let the guests paint picture frames green and then paint on ladybugs. An easy way to make ladybugs is to have them dip their index finger in red paint and make dots on the frame. Then come back when dry with a small paint brush and paint on the dots, eyes and antenna’s. Decorate clay pots with red and black paint. Then fill with dirt and a few flower seeds. Find or buy smooth flat stones before the party. Try and buy enough so that the kids will have a choice on the rock that they will paint. 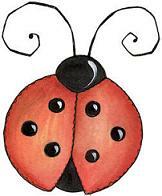 Set out black, white and red paint and paint brushes and let the guests paint their rocks to look like ladybugs. Give them googley eyes to glue on their ladybugs. They can name their new ladybug pets too. Bake and then frost cupcakes with red icing. Using red paste from a cake decorating or craft store will give you the best “red“. Use black or brown decorating gel to divide the cupcake in half - for the wings and draw on antenna. Use brown mini M&M’s for the eyes and regular size M&M’s for spots. A cupcake tower / stand makes a pretty centerpiece when showing off the ladybugs. Or after icing the cupcakes red place them in a circle on a plate. Place Oreo cookies for spots and use string fruit rollups to divide the wings and antenna. Ladybug stickers, jewelry, necklaces, charm bracelets or stick on earrings. Any red candy in individual packages. Red paper sacks - draw black dots with permanent marker or use black stickers. Round boxes painted red with black dots.